Robert Bosch GmbH expects sales in its automotive technology unit to exceed 30 billion euros this year, for the first time, the unit's chairman Bernd Bohr, said. The rise would represent a 10 percent hike in sales and is expected to be helped by strong growth in Asia. Sales for the unit in Asia have more than quadrupled in 12 years, from 1 billion to 7.4 billion euros, Bohr said Tuesday at a press event in Stuttgart. Bohr added that Bosch plans to increase its workforce over the coming year and will invest 3.2 billion euros in automotive technology research and development in 2011. ''Having begun the year with 167,000 associates (employees) in automotive technology, by the end of the year we will have 177,000. Asia Pacific is responsible for most of this increase, but other parts of the world are also seeing growing numbers of associates,'' Bohr said. Bosch has plans to be at the forefront in the development of electric powertrains and chassis production and currently spends 400 million euros a year on the technology, employing 800 engineers in EV research and development. ''By 2013 at the latest, we will start series production of nearly 20 projects for 12 automakers, involving products for electromobility across our entire portfolio,'' Bohr said. Bohr said the high cost of electric mobility will push automakers and suppliers into pooling production and standardizing components to reduce costs through economies of scale at a faster rate than now. Bosch is establishing a joint venture with Daimler AG to develop, manufacture and sell electric motors for Mercedes-Benz and Smart cars, Daimler announced in April. The joint venture will start production next year. 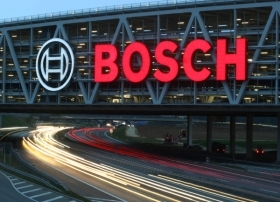 Suppliers such as Bosch are likely to do well out of the competitive push to develop electric vehicles in the future, Bohr said. Expertise is electrical and electronic systems today represent a value added share in vehicles of 40 percent, a share that is expected to rise to 75 percent in future electric cars. Automotive technology is the largest Bosch Group business sector. In 2010, its sales were 28.1 billion euros, representing 59 percent of total group sales.